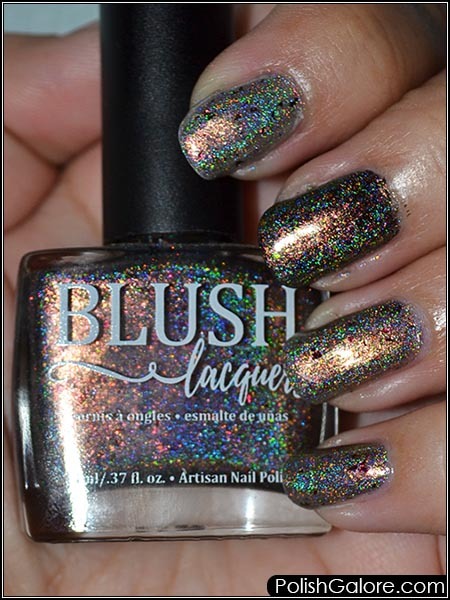 Another beauty that I got during PolishCon Chicago 2017 was from BLUSH Lacquers and is called Frosted Foliage. This was part of the Beauties Fall Collaboration Collection that was released in October 2017 and it was just so unique to me. This is a grey jelly base with a strong red/orange-gold-green shifting shimmer, a linear holo and red-orange-gold shifting flakes. You can see from the bottle above that it looks very orange originally! I used Morgan Taylor ReactMax Optical Brightener as my base coat and started with 3 coats of polish. However, I felt it was a little too jelly for me so on my middle finger, I did a coat of Cult Nails Fetish (a matte black) and on my index finger, I did a coat of Glisten & Glow Saddle Shoes & Sock Hops (a grey creme). For my middle and index finger, I only did 2 coats of polish. I topped all my nails with Glisten & Glow Top Coat. Look how much holo you can see when I just hold the bottle! It's like a whole new polish from above! So I really like having the index finger with that grey under but I feel like I lose a little bit of the green shift shimmer doing that. With the black on my middle finger, it almost makes this polish too dark. Now check out that holo. It's super strong. I can really see this being a fun polish to wear. Some of the flakes were a little bigger than I prefer but removal was super simple with no scrubbing or tearing of my nails. At the time of this writing, this polish is still available for $12 a bottle. BLUSH Lacquers may be purchased on their website. Join the social conversation with their Facebook Group or on Instagram.